Manhattan said "Yes!" to a non-nuclear world last week as famed Japanese artist Seitaro Kuroda (video) and the Hiroshima Yes! Campaign kicked off "The Count Down to Peace - 100-Day Event." Held at the trendy art gallery hpgrp Gallery on Little West 12th Street in the Meat Packing District, the event was live feed between New York, Tokyo, and Hiroshima. The project is called simply PIKADON. The PIKADON project event featured a was live feed between Hiroshima, Tokyo and New York. Photo courtesy of Keiko Tsuyama. 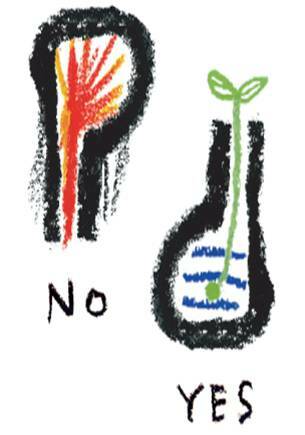 Organizers of the PIKADON project, conceived by Japanese illustrator Seitaro Kuroda, are using artwork as a statement to creatively engage New Yorkers to reflect upon the bombings of Hiroshima and Nagasaki 60 years ago. "We are going to drop an art bomb on New York," said my friend Taku Nishimae, the project's New York manager, who is coordinating the citywide effort to educate Americans about the potential dangers that still exist today with the proliferation of nuclear weapons. Although the atomic devices were dropped on two cities in Japan at the close of World War II, Taku feels it is necessary to draw attention to global nature of the problem, rather than to dwell on it as a Japanese experience. "It is not about the past and not just about two cities in Japan," he said. "It is and it isn't. It is not about an event 60 years ago but about now and the future." Famed Japanese artist Kuroda-san who I met several years ago is the founding member of the PIKADON Project. PIKADON Project & the Hiroshima Yes! Campaign are collaborating on creating a series of events and campaigns through the arts and media to emphasize the Hiroshima−Nagasaki Protocol, a roadmap for every citizen of the world to participate in the realization of a non-nuclear world in the future. Seitaro Kuroda's signature event "Live Painting" has been featured by international media and is the subject of the film "White Light/ Black Rain" directed by Steven Okazaki. 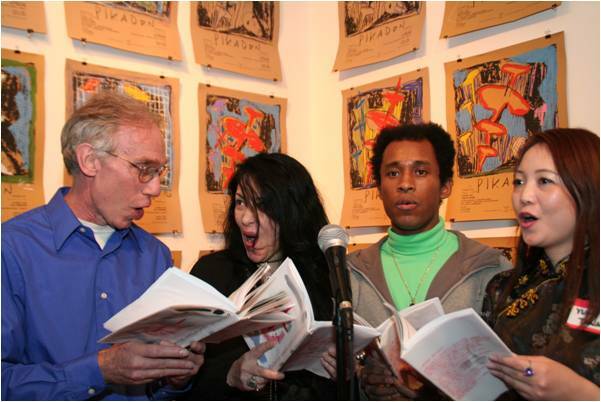 PIKADON Project may be described simply as a creative arena for all citizens around the world to express themselves through art in 2010 and beyond towards the realization of a non-nuclear world. The event last week kicked-off a dynamic fusion of art initiatives for the no-nuke movement dedicated through art to raise awareness and understanding to stop the proliferation of nuclear weapons. It was the first in a series to highlight the 2010 Review Conference of the Parties to the Non-Proliferation Treaty (NPT) to be held from May 3, 2010 at the United Nations Headquarters here in New York. Seitaro Kuroda is probably Japan's most famous illustrator. His drawings appear in scores of Japanese books and magazines. PIKADON will be producing a series of "Live Painting" events featuring Seitaro Kuroda along with a group of international collaborators and youth around the world. Other stops include Los Angeles, Berlin, Shanghai, and of course Hiroshima. Last spring, I met and interviewed the mayor of Hiroshima, Tadatoshi Akiba, who is a good friend of Seitaro Kuroda and the founder of Mayors for Peace (interview). Each of PIKADON's events will coincide with an art exhibit, "Art Conversation" programs with children, and postcard exchange projects. The project will also produce an orchestrated international collaboration of PIKADON Art Image Projection Initiative. As in the past, PIKADON plans to continue in 2010 to work with its growing group of international collaborators in projecting images and animation on top of landmarks in major cities around world (more). The PIKADON event in New York was connected live to Tokyo and Hiroshima. Photo courtesy of Keiko Tsuyama. In addition to Seitaro Kuroda, PIKADON Project founders include musician Toshinori Kondo, photographer Nobuyoshi Araki, and architect Tadao Ando. These internationally renowned artists got together to create a truly remarkable art initiative. Since its inception, the PIKADON Project, has landed in 16 cities around the world, collaborating with international artists, activists, youth and various media carrying the message to develop an arena for dialog and art inspiration. Through these amazing live events and art works, PIKADON Project, has developed a revolutionary new way of inviting all people to participate in expressing themselves in the hope of realizing a Non-Nuclear world (video). Reciting from an art book illustrated by Kuroda-san on the Hiroshima-Nagasaki Protocol. Photo courtesy Keiko Tsuyama. The project is a non-political movement inviting all people to participate through all forms of art to express themselves, in a hope of realizing Non Nuclear world. 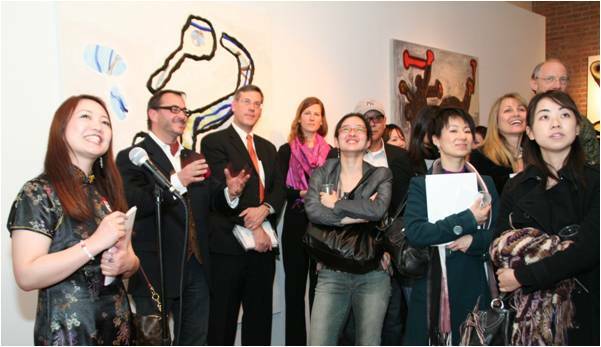 PIKADON offers an array of innovative art events and programs that empower, educate, entertain, and inspire. In an unprecedented avant-garde fusion of art, music, and literature, PIKADON brings together a global group of performers and artists to further our mission. They also collaborate with young people around the world, as they are the future of our planet. "With the PIKADON Project, we want to heighten people's awareness of their own lives and the lives of others on the planet - past, present and future, through the support of creative artistic expressions of all genres," Taku explained. The Japanese colloquial word for atomic bombing is Pikadon. It is a compound of the two onomatopoeia words pika and "don." Pika describes a flash of light and "don" describes an explosive sound. One might refer to the pika of a lightening flash and the corresponding don of a thunderclap. Survivors of the bombings began to use the word Pikadon to describe the catastrophic events. The compound word, therefore, has become synonymous with great tragedy and suffering. The simplicity and childlike directness of the individual sounds, however -- like "pow!" and "boof!" in superhero comics -- also evoke the playfulness of manga and anime. Without forgetting the tragic past, Mr. Kuroda seeks to harness the energy locked within Pikadon. "Atomic energy is the energy of the sun," Taku explained. "The sun has the power to destroy; yet it is the source of all life. Nuclear weapons tap the destructive side of this energy." Artist Kuroda imagines focusing the same force to life and art - towards "living-ry." He envisions the PIKADON Project as a comprehensive worldwide initiative of art and performances where each event fosters greater action and reaction - a chain reaction inspiring people to embrace life. The Board of Directors for PIJKADON includes producer Taku Nishimae, journalist Keiko Tsuyama, and the director of the New York Peace Film Festival, Yumi Tanaka. I wrote about Keiko's media career last spring (here). Seitaro Kuroda is probably Japan's most famous illustrator. His drawings appear in scores of Japanese books and magazines. His design work spans the gamut from buildings, stores and interiors to logos, t-shirts, posters, and CD covers. Besides making art in a studio setting, Mr. Kuroda collaborates with musicians from all over the world in performances he calls "live painting." 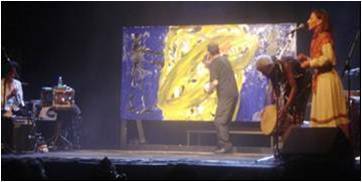 The musicians and the artist jam with Kuroda who improvises using his own "instruments"-- the paintbrush and more commonly his hands. The finished work is often auctioned to benefit a charitable organization. He also takes his art to the streets by painting with children in schools and hospitals. In the late 1990's, during the aftermath of the earthquakes in Kobe and Taipei, the painter-performer traveled to the disaster sites to paint with children whose homes had been destroyed. Mr. Kuroda feels a keen personal connection with the atomic age. The first successful nuclear fission experiments were concluded in 1939, the year of the artist's birth. In 1945, the Bomb was dropped on Nagasaki and Hiroshima. Kuroda-san feels poignancy in the contrast between his own nescient development in those six years to that of nuclear weaponry- a force with the power to destroy the entire planet. When smoke darkened the Manhattan skies on September 11th, 2001, it reawakened Mr. Kuroda's memories of the nuclear blasts. Since then, he has increasingly focused his attention on promoting awareness in issues of nuclear disarmament and world peace. Similar to the visionary architect-designer Buckminster Fuller's call for society to move from "weaponry" to "living-ry," Kuroda-san urges us to turn upside down the "mushroom cloud," a symbol of nuclear destruction, and turn it into a vessel that nurtures life. 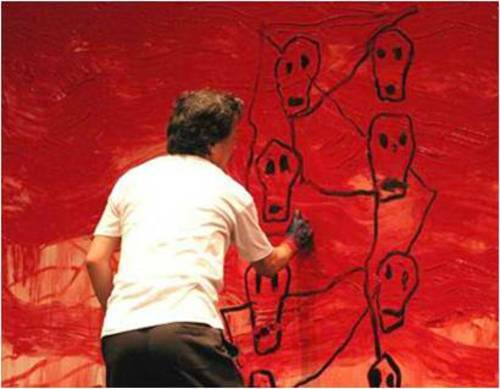 The project was conceived in 2004 in Japan ahead of the 60th anniversary of the atomic bombings, featuring artwork by Mr. Kuroda, a celebrated illustrator whose trademark mushroom cloud is unique because it features two depictions -- the familiar black one of destruction and an inverse of the image. It was only after living through the terrorist attacks on the World Trade Center's twin towers in New York on Sept. 11, 2001, and watching the black smoke billowing over the buildings that he had a revelation. He came to realize that the black smoke was just like the mushroom cloud. Sometime later, however, he thought about how the image in reverse could be seen as a vessel from which life sprouts forth. Mr. Kuroda has been very helpful to the organization I founded, Orphans International Worldwide. We have one of his paintings for sale to help the orphaned children of Haiti. It is because of his determination to better our world, Orphans International Worldwide is acknowledging Mr. Kuroda efforts by presenting him with our 2010 Global Citizenship Award For Leadership In Helping Humanity at a benefit for Haitian orphans on Sunday, Feb. 28, at historic Webster Hall in New York's East Village. For more information about PIKADON, contact Mr. Taku Nishimae.